Dear ILL Patrons: The ILL Department is currently experiencing a staffing shortage, and we apologize in advance if it takes somewhat longer than usual to process your orders, especially over weekends. We expect this to continue for the remainder of the summer, so if you have interlibrary loan needs, please try to give us as much lead time as you possibly can to fulfill your requests. Our normal hours will continue as usual, with the exception of Monday, Aug. 6, when we will be closed for the day. Thank you for your understanding and please continue to submit new ILL requests! We will continue to fulfill them as quickly and thoroughly as we possibly can! This entry was posted in Library, Middlebury Community Interest, Post for MiddNotes, Post for MiddPoints and tagged ILL, Interlibray Loan, Library Spotlight, LibrarySpotlight, libspotlight, Staffing on July 17, 2018 by Rachel Manning. Looking for something to do with your kids now that they’re free for the summer? Take them to the ECHO Center in Burlington! The library has a pass that allows for $7 admission for each guest (up to 4 max). Regular admission prices are $11.50 for kids and $14.50 for adults. The pass is available for checkout at the circulation desk to all college faculty, staff, and students for three-day loan. This entry was posted in Library, libspotlight, LIS Staff Interest, lisblog, Middlebury Community Interest, Post for MiddNotes, Post for MiddPoints and tagged borrowing, circulation, Circulation Services, Library Spotlight, LibrarySpotlight, libspotlight on June 6, 2018 by Dan Frostman. Now available for checkout from the Davis Family Library Circulation desk: a family pass (up to 8 people in one vehicle) for free entry into a Vermont Historic Site. This means you can go see and of these historic sites – the Bennington Battle Monument, President Calvin Coolidge, Chimney Point, Hubbardton Battlefield, Senator Justin S. Morrill, Mount Independence, Old Constitution House, President Chester A. Arthur, and Eureka Schoolhouse and Baltimore Covered Bridge – for the bottom line price of zero dollars! At that price, you can’t afford to NOT go learn some history! The pass is available for checkout by all college faculty, staff, and students for a three-day loan period. This entry was posted in Library, libspotlight, LIS Staff Interest, lisblog, Middlebury Community Interest, Post for MiddNotes, Post for MiddPoints and tagged borrowing, circulation, Circulation Services on June 6, 2018 by Dan Frostman. Going away this summer? Take the library with you! 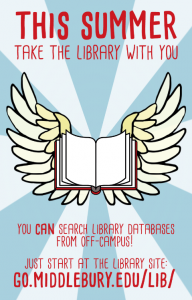 You can search library databases from off campus. Just start at the library site: go.middlebury.edu/lib. From there, JSTOR, ebooks, audiobooks, Summon and all of our online journals, magazines and newspapers are available to you…no matter where you are! When you’re off campus, links that are on library web pages (a few examples of library web pages include Research Guides, Summon and the Journals list) will ask you to log in with Midd credentials. It’s as easy as that! Seniors: Here’s how to get alumni access to library databases! This entry was posted in Middlebury Community Interest, Post for MiddNotes, Post for MiddPoints and tagged Library Spotlight, LibrarySpotlight, libspotlight on May 8, 2018 by Carrie Macfarlane. The Davis Family Library will be open 24 hours a day starting Sunday morning, May 6th. Regular hours resume for Friday and Saturday, May 11th and 12th, then 24/7 resumes until 11 pm on Friday, May 18th. Saturday’s hours are 9 am – 11 pm, then 24/7 resumes at 9 am on Sunday, May 20th and the library will close at 8 pm on Tuesday, May 22nd. During this period, you will need your ID to access the building after 9 pm. After 1 am, there will be no circulation services provided – the library will only function as a quiet study space. Armstrong Library will have regular hours. 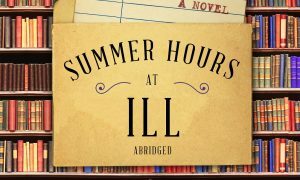 This entry was posted in libspotlight, LIS Staff Interest, lisblog, Middlebury Community Interest, Post for MiddNotes and tagged borrowing, circulation, exam hours, hours, library hours, Library Spotlight on May 1, 2018 by Dan Frostman. This entry was posted in Library, Library News, libspotlight, LIS Staff Interest, Post for MiddNotes, Post for MiddPoints and tagged citations, CTLR, group study, Librarians, Library Spotlight, libspotlight, research, slang, tutors, writing on April 18, 2018 by Katrina Spencer.